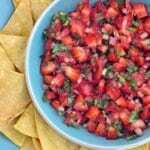 Strawberry Salsa and Baked Corn Chips | JPMA, Inc. Mix all ingredients together in a bowl. Flavors will blend if refrigerated for 30 minutes or more before serving. Choose a baking temperature (between 375 and 450 degrees) and preheat oven. Plain - Sprinkle with salt or other seasonings, if desired. Cooking spray – Spray lightly with cooking spray. Sprinkle with salt or other seasonings, if desired. Oil – Brush oil on one side of each tortilla. Sprinkle with salt or other seasonings, if desired. Cut each tortilla into 8 wedges. Arrange in a single layer on a baking sheet. Bake for 5 to 10 minutes depending on oven temperature. Watch closely to avoid burning.